Beginning at the east side of the Shasta Dam, you'll run across the Dam and then down the winding paved road to the campground below. From there, you'll veer off onto the paved Rail Trail and then to the River Trail. 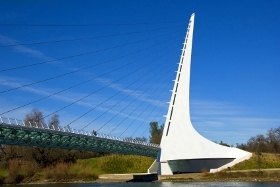 Crossing the Ribbon Bridge, you'll stay on the River Trail with the marathon ultimately concluding at the Sundial Bridge. There will also be a three-person marathon relay and a 5K.